In the welcome page, click on the Create account link. The following site will ask you for an eMail address, which will be your login id as well. The eMail address is necessary, because the server will generate a random password and sends it to you in order to avoid user accounts which will not be used by anyone and unnecessarily will stick on the server. Please note that you should read the terms of this service in prior. Send your information via the "save"" link to the server. After you received the password you will have to login to the server, which will activate your account. Now you should provide a new, individual password. If you entered your password too often, the server will lock your account. To unlock your account, you must click on the "Request new PWD" link. This will reset your account and a newly generated random password will be sent to you. Please login with this password and change it afterwards to an individual one. Once logged in, you can change your account data. By clicking on the link "Admin account" you will see the possibility to change your login id (which will be your eMail address) and / or your password. But be careful - if you change your login to an invalid address, the server has no possibility to send you a new password if you have forgotten your old one. 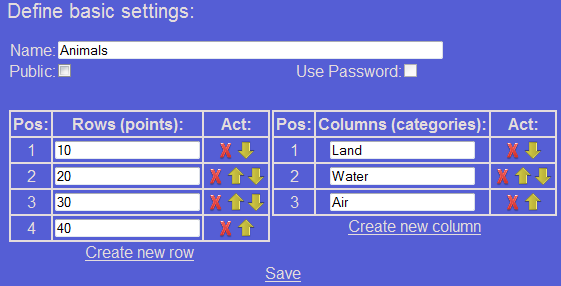 As a logged in user you have the possibility to create any game grid (which is conform to our terms). To do that you have to click on "New Game" and the basic settings Page will occur. Here you can provide a name for your grid. Also the points (row values) and the categories (column values) can be entered. You also can check the checkbox "Public", which will set the game grid to a public mode - so other people can use your game grid. Please try to find a name for your game grid that gives a meaningful indication of the content of your grid. If you want to limit the user accessing your game grid, you should provide a password by checking the checkbox "Use password" and then provide a password clicking on "Set PWD". Then only user who provide the correct password can use your game grid. All settings will be stored by using the "Save" link. Now you should enter the questions and answers by clicking on the "Edit questions" link. 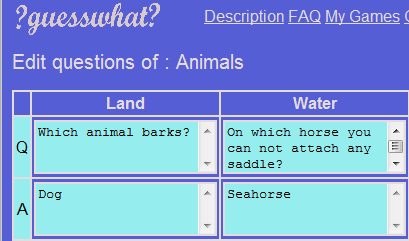 The following page allows you for every game grid field to provide a question (in the rows marked with "Q") and a corresponding answer (in the rows marked with "A"). Note: words with many letters might broaden the resulting game grid boxes too much - so it is sometimes better to separate the words with a "- ". For Example the Word "Neurophysiologically" might be separated in "Neurophysio- logically". All settings will be stored by using the "Save" link. There are three possibilities to access a game grid. The first is to access a game grid you created. For this the "My games" site must be called (this is done either after login, or by clicking on the Link "My Games"). There you will see all games you have created previously. By clicking on the name of the grid, a new page will open and you will see the game grid in game modus (or the game password page, if a password was set to be required). The next possibility is, if you have started to play a game and stored the (not finished) game status, you can reenter the game. For this you can click on the number in the "Stored" column. This will open the stored status page, where the different stored status will be accessible by clicking on the link. The timestamp information indicates the time, when this status was stored the last time. The last option is to enter the public games. These are games from other user, which were marked as "Public". To access these games you must click in the "My Games" dialog on the "Public Games" link. If you have stored a previous status of a public game, it will also appear in the "My Games" dialog, but not with any options to change the game. When you want to change a game, you must be very careful, because changing the number of columns or rows of games where any status information is already stored, might lead to unexpected behavior. However, to change a game, you must click on the "My Games" dialog on the pen symbol. Then the same dialogs will occur, you already know from the creation of the game grid. There you can change the order of the rows or columns (arrow symbols), delete rows or columns (x symbol) and change any text. Be aware, that if you change the name of the game grid and save it, you will not create a new copy with a different name - you will only change the name of the given game grid. When entered a game, the usage is straight forward. A click on a numbered field will show the question. Is the next click on the answer field then the corresponding answer will be displayed. In order to simplify the identification of the relation between question and answer, the relevant question will be marked with a red frame. If you did not manage to finish a game, you can store the status on the server. This is done by clicking on the "Save current status" link. Now a popup box appears and you can enter a name for the stored status in order to identify it later on. The name must not be unique - if you provide a name which already exists, there will be two status values stored on the server. A timestamp value will help you in those cases to identify the correct one. However, if you opened a status and you store it again, the old status value will be overwritten (and if you provided a new name, the old name will be replaced as well). When you finished a game (meaning you opened all question boxes) the stored status will be deleted from the server automatically.